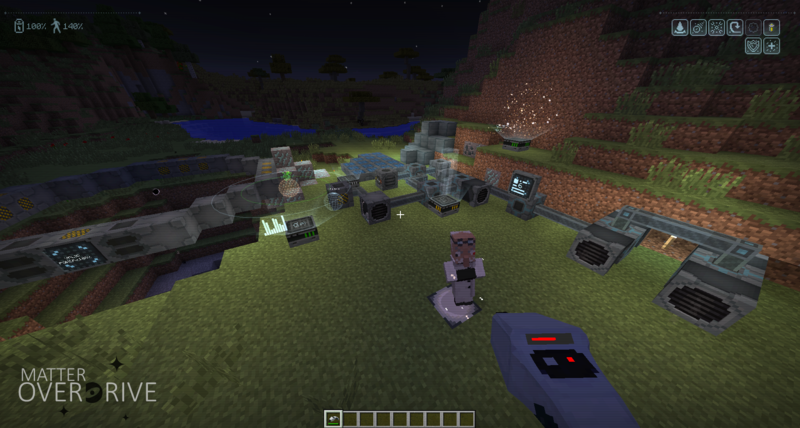 Matter Overdrive is a Minecraft mod, inspired by the popular sci-fi TV series Star Trek. It dwells in the concept of replicating and transforming one type matter into another. Although it may seem overpowered, Matter Overdrive takes a more realistic approach and requires the player to build up to complex system before even the simplest replication can be achieved. Item and Block Replication with pattern scanning. Advanced Weapons and Tools with modular customization. Complex Networking for replication control. Star Maps, with Galaxies, Stars and Planets. Androids, become an Android and learn powerful RPG like abilities, such as Blink, Forcefield and Night Vision and much more. Conversations with an advanced RPG like dialog system. Quests, contracts and missions with various objectives. Many decorative sci fi blocks.